Friday 13th - Unlucky or not? When I am watching the news BBC..They are discussing about Friday, 13th! I don't know what it is the date of meaning..My uncle said some of ancient cultures and the superstitious fear of Fridays and the number 13, it will show an explanation of how, why or when these separate strands of folklore converged — if that is indeed what happened to mark Friday the 13th as the unluckiest day of all. If something will be happen to you if you get lucky on Friday, 13th. Such as, involved in accident, robbery, lost money, bad health or etc.. Do you feel unlucky during Friday, 13 th? :D I don't feel anything happen to me.. :) I am lucky, enough? :P Some culture believe Friday 13th as bad luck..
Watch out for black cats! 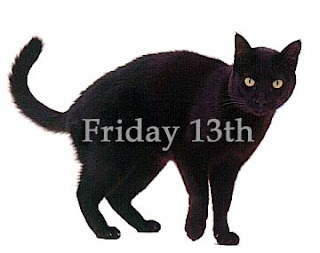 As most people probably already realize, today is Friday the 13th, a date commonly associated with bad luck. For the next several hours, millions of superstitious individuals across the country will hold their breath anticipating misfortune. Others will avoid leaving the house altogether, refusing to drive, shop or work on the ill-fated day... How it can happen ? Who know?